Whatever you think about the current state of American culture, it’s clear that Christianity no longer has the influence it once had. There isn’t any use in becoming upset about it or complaining about it because that will change very little, if anything. Instead consider asking how should Christians posture themselves amidst a culture that appears less than receptive to Christianity? The Courage Not To Fight Back! Perhaps the best response Christians can have towards the current changing American culture is having the courage not to fight back! Christians Have Lost Their Temper? Every year as Thanksgiving, Christmas, and New Year’s Day approaches, there are some Christians who insist upon engaging in a culture war over the greeting “Merry Christmas.” By insisting upon the phrase “Merry Christmas” as opposed to “Happy Holidays” or “Seasons Greetings,” they think that the society at large will remember the “reason for the season.” They call for Christians to boycott stores that don’t mention Christmas, voice their protest in various social-media outlets, align themselves with various political talking-heads (some who may not even be Christians), and even make a movie about saving Christmas. Is this really about living as faithful witnesses of Jesus or is it about preserving a culture that favors Christian sentiments? In other words, is this culture war over Christmas motivated by a desire to serve God or a selfish political desire? To be frank, I really don’t care whether a person says “Merry Christmas” or “Happy Holidays.” What I’m concerned about is the notion that some Christians have which believes that this is a spiritual battle that they must stand up and fight. They seems to believe that Christians can and should go blow for blow with society. However, taking a page from Branch Rickey, when this is done, society only seems to think that Christians have lost their temper… and seem quite ready to leave us to ourselves where we can pout in the corner while we have a tantrum. Isn’t there a better way? I certainly believe so! For the last few weeks I’ve been preaching through the book of 1 Peter. In one sentence, this is a letter that addresses how Christians must live as the holy people of God amidst a hostile culture. Never does Peter say anything about fight back, standing up for your rights, boycotting and protesting those who don’t show favor to Christian values. Instead Christians are persistently reminded to be the church. That is, instead of trying to determine how the rest of society should live, Christians should make every effort to embody the living hope they have received. Loving one another, serving one another, being hospitable… Think about it! Branch Rickey told Jackie Robinson that they would win with hitting running, and fielding. Peter is telling us who call ourselves Christians that we win by loving one another, serving one another, being hospitable towards each other. If we really believe in Jesus then we need to be Christians who have the courage to not fight back… or at least not fight back on society’s own low ground. Instead we must learn to fight with love, service, and hospitality. Then we become a living demonstration of the reason for the season, the life Jesus came into this world to offer through his own death and resurrection. This entry was posted in Church, Contemporary Christianity, Contemporary Culture, Faith, Scripture. Bookmark the permalink. I find it ironic that some folks in the Church of Christ would complain about the word “Christmas” not being said. After all, wasn’t it us who kept harping that Christmas isn’t Biblical, meaning “we can keep it, just as long as we don’t really keep it”? That aside, Christmas is alive and well. I see collection boxes for food banks and Salvation Army kettles over flowing. I see people giving extra for food banks when paying for their groceries. 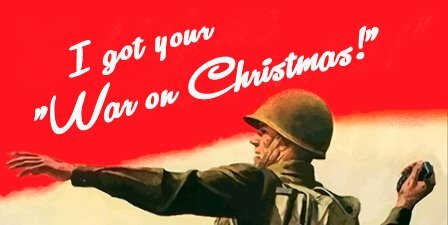 So, my challenge to those who are crying about the war on Christmas. Each day, each time, you pass a food bank collection box or a Salvation Army kettle, drop in a dollar or two. You’ll be quite surprised just how sweeter the rest of the day will seem. And if you really want a lesson in Christianity, grab a lectionary and read the portions from Jeremiah and Isaiah describing a messiah who would come and the gospel describing the incarnation, the Magnificat, and the birth of Christ. These paragraphs were rarely, if ever, heard in a cofC. I never remember hearing them at all. Good thoughts. I was immediately drawn to this parallel when I first watched “42.” Thanks.